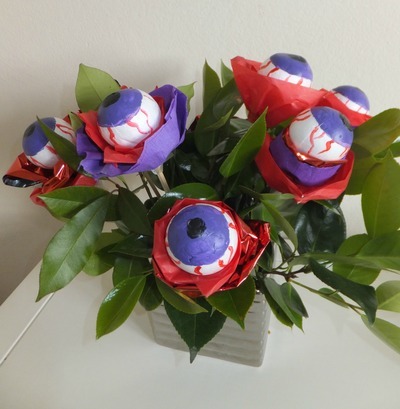 Make your own Floral eyeball bouquet as a table decoration for Halloween. Insert skewers into foam balls and place in floral foam box. Paint eyeball onto foam, leave to dry. Cut strips of crepe paper and run sticky tape along one end. 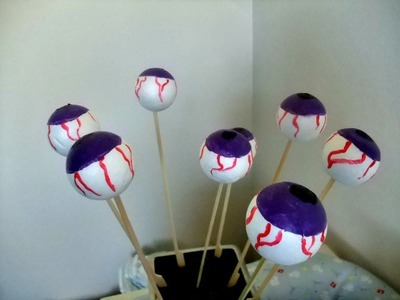 Wrap crepe paper around skewer at base of eye ball to make flowers. You can use two or three contrasting colours on textures, layering down the skewer. Cut plant trimmings with firm stalks from the garden. Insert plant trimmings into foam box around the eyeball flowers. If you fill your foam box a week or two before Halloween, it will give the leaves time to brown and dry out.